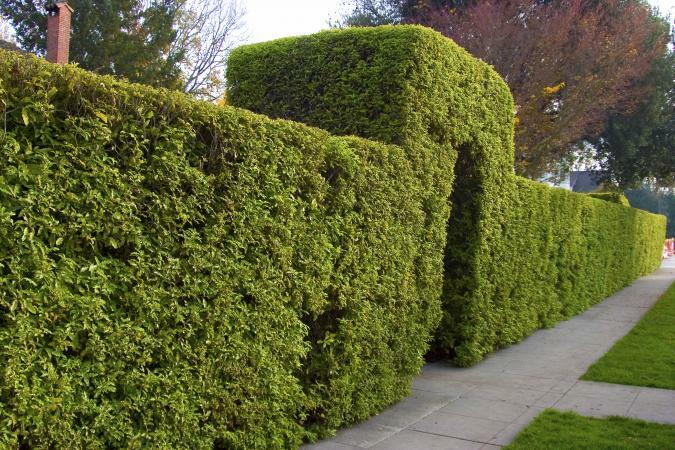 The best shrubs for privacy grow densely, require little maintenance and block a view completely. There are two kinds of privacy shrubs - those that are evergreen and those that are deciduous and lose their leaves each fall. Decide which type will work best for your yard. 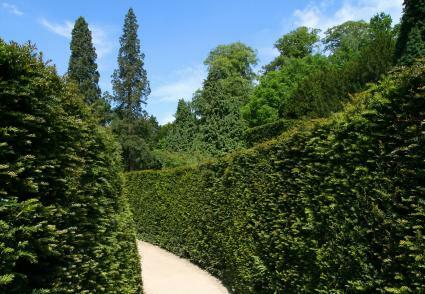 Some privacy hedges grow very fast, while others take time to mature. If you're in a hurry and you don't mind putting in a lot of time trimming, you should consider the faster-growing shrubs which will establish themselves quicker. On the other hand, slow to medium-growing shrubs require a lot less maintenance in the long run, even if they won't provide full privacy for a few years as they develop. Berckman's Golden Arborvitae: This evergreen shrub grows to a height of five feet and is densely branched. 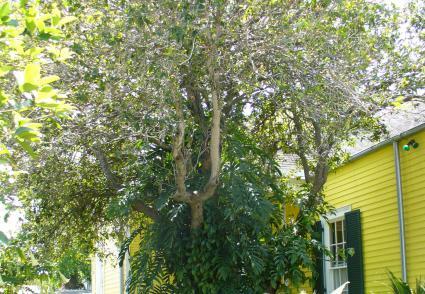 It remains golden-colored year 'round and does not require pruning. 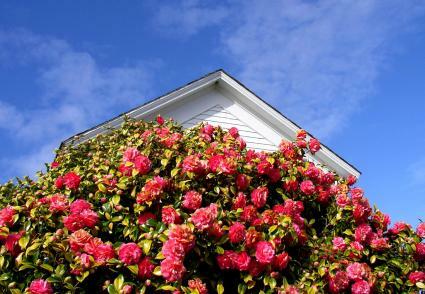 Camellia Japonica: This is a flowering evergreen that grows to a height of 12 to 20 feet and spreads 10 to 15 feet wide. The spent blooms should be removed. 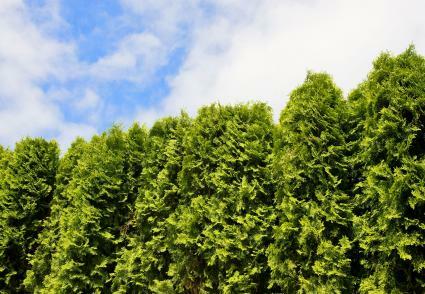 Emerald Arborvitae: This evergreen beauty grows to a height of 15 feet and spreads up to four feet wide. It rarely needs any pruning. 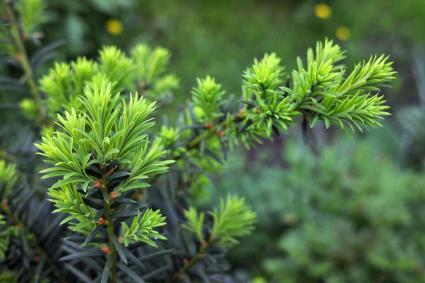 Japanese Yew: This column-shaped, evergreen shrub can grow to a height of 30 feet or more. It can be grown in areas with a salt spray. 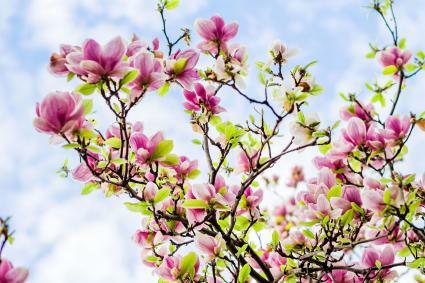 Saucer Magnolia: The Magnolia is deciduous, but it works well as a hedge when used in groupings. It will grow to a height of 20 to 30 feet if not pruned. Dense Yew: This evergreen shrub grows up to six feet tall, and it spreads widely with dense branches. You can prune it as desired. 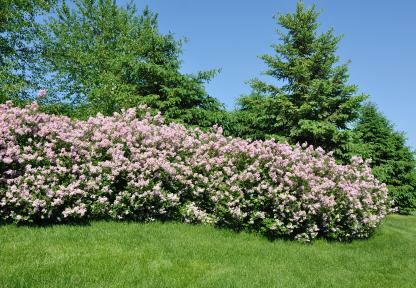 French Lilac: This deciduous shrub grows 8 to 15 feet tall and will spread slowly as additional shoots grow. It produces fragrant blooms in a variety of colors. 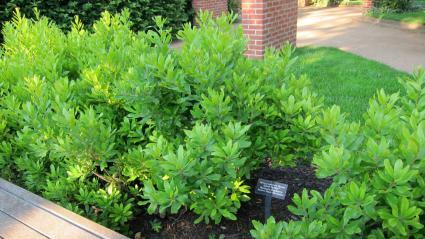 Savannah Holly: This evergreen grows 8 to 12 feet tall and six to eight feet wide. Female plants produce the familiar red berries. This shrub may be pruned if you desire. Sweet Olive: This evergreen grows up to 10 feet tall and eight feet wide. This plant is a broadleaf evergreen with dense branches, and its tiny white blooms produce an apricot fragrance. 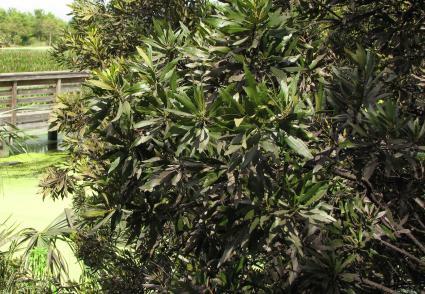 Wax Myrtle: This evergreen shrub grows up to eight feet tall and eight feet wide. It can be pruned to the shape you like. 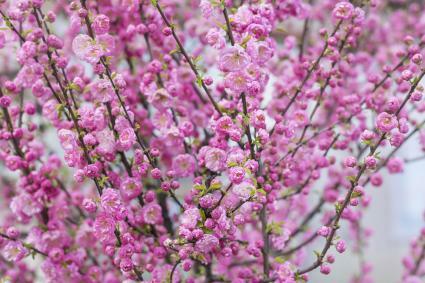 Dwarf Pink Almond: This deciduous shrub grows up to five feet tall and four feet wide, and it produces double pink blossoms. It should be pruned each year after blooming. 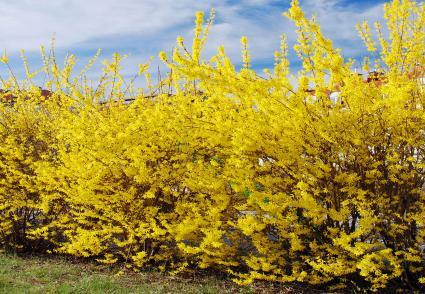 Forsythia: The deciduous Forsythia can reach heights of 10 feet tall if not pruned, and it grows up to 10 feet wide. It produces an abundance of small yellow flowers each spring. 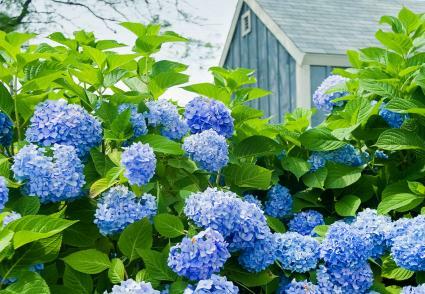 Nikko Blue Hydrangea: This deciduous shrub grows up to 12 feet tall and 12 feet wide. It produces large, blue snowball-shaped blooms. It can be pruned if you desire. Northern Bayberry: This Bayberry is deciduous and grows up to nine feet tall with dense branches. It spreads several feet wide, but you can prune it as you desire. 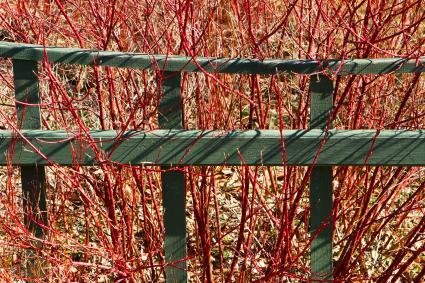 Red Twig Dogwood: This deciduous shrub grows up to eight feet tall and spreads several feet wide. It's noted for its red twigs in the winter and creamy white flowers in the summer. Deciding which shrub to plant can be a little daunting. Consider the following points to help you make the right selection. If you choose a formal fence, plan on spending time shaping the bushes each year so they'll look neat and tidy. If leaving things alone is more your cup of tea, choose an informal fence that is either one low-maintenance variety or a combination of privacy bushes. The location you choose is very important when deciding which plants you'll use in your privacy fence. Roots grow down and laterally. The bigger the plant, the longer the roots will be. This is an important consideration when the plants will be located near a sidewalk, foundation, pool or driveway. 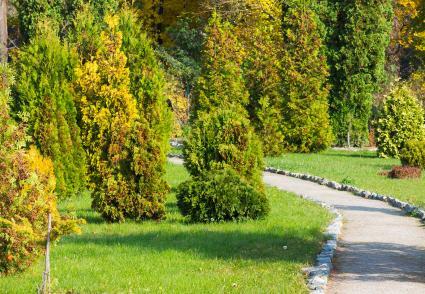 When you're choosing shrubs, be sure to know what the mature size will be. The size that the plant is in the pot may be small in relation to what it will look like fully grown. Most plants at a nursery will have tags that detail the care and mature size for each plant. If you're not sure, ask an employee in the gardening center for more information on a particular plant. In order to choose the best shrubs for creating a privacy fence, take a look around your neighborhood to see which shrubs already exist. This may help you select the best plants for your hardiness zone. It is also important to decide whether you want lawn debris from a flowering or deciduous shrub or an evergreen that requires little maintenance. 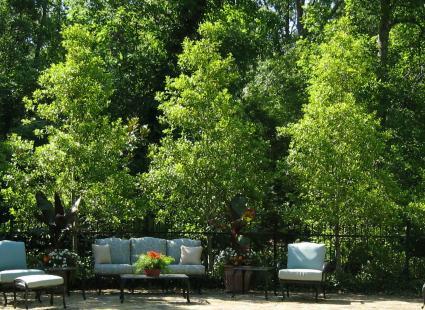 In addition, many shrubs look even better in groupings instead of just one type of shrub. Check out local nurseries early in the spring for the best selection, and you'll be on your way to a beautiful privacy fence in no time!